Feb. 1: Several UIT team members were transferred to the UNT Division of Enrollment: Irene Frank, Mari Jo French, Jennifer Lee, Maureen Saringer, and Monica Scott-Taliaferro. Dec. 20: Karen Snyder and Cindy Hall moved from the General Academic Building to the Hurley Administration Building, Room 350. Offering the same service in a different location they will have a new reporting structure too as members of University Information Services. 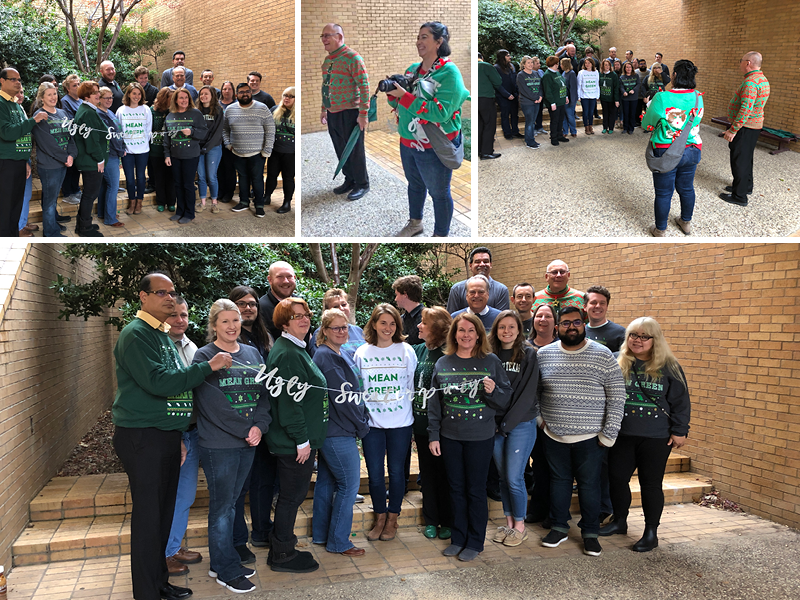 Dec. 7: Bob Brown, senior vice president, and Margarita Venegas, senior communications strategist, Division of Finance and Administration, visited the General Academic Building to photograph and judge the University IT staff who entered the division's Ugly Sweater Contest. 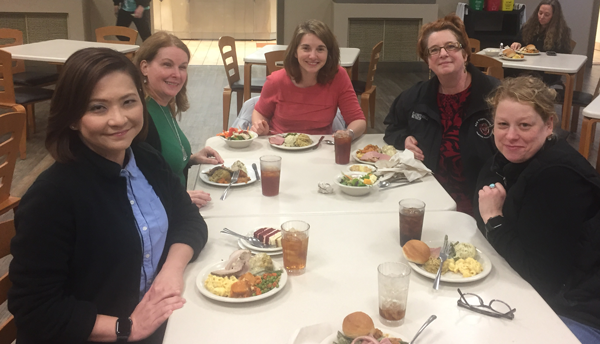 Dec. 6: A few UIT colleagues met for lunch at West Hall for a little pre-holiday camaraderie: Jennifer Lee, left, Maureen Saringer, Irene Frank, Elizabeth Hinkle-Turner and Catherine Pike. Nov. 29: University IT hosted an open house for Research IT Services. Approximately 50 visitors attended one of the four presentations conducted by RITS staff members. Among the distinguished visitors, Bob Brown, pictured in the holiday tie, senior vice president for the Division of Finance and Administration, stopped by for a Data Center tour and refreshments. Pictured here are Ravi Vadapalli, left, Philip Baczewski, Bob Brown, DaMiri Young, and Su Gao. Oct. 22-23: The National Science Foundation's Computing and Autonomic Center's Industry Advisory Board Meeting was mentioned in the Oct. 27, 2018, in the North Texas Daily article "UNT proposes to become an affiliate site of the NSF research program." 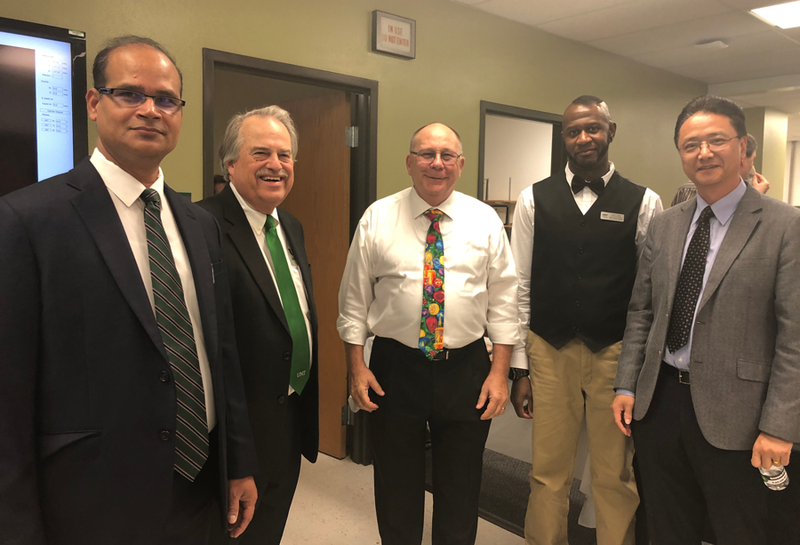 Ravi Vadapalli, director, Research IT Services and former CAC site director at Texas Tech University, headed the University IT team to host the board's fall meeting Oct. 22-23 at UNT's Gateway Center. Other participants included Charles Peterson, who coordinated the student poster presentation, DaMiri Young, leader of the Data Center tour, Karen Snyder, coordinator for hotel accommodations, purchasing, venue reservation food contracts, purchasing, transportation and parking and guest reception. Lien Nguyen and Amisha Gadhia, student assistants helped with reception, collateral materials and name tags. Monica Scott provided media relations support, photography, event website management, collateral materials, event registration, management and leadership. UIT Marketing Office Student assistants, Amisha Gadhia, computer science graduate student, and Lien Nguyen, business analyst graduate student, have "attacked" the UIT observance of the 15th annual National Cyber Security Awareness Month. 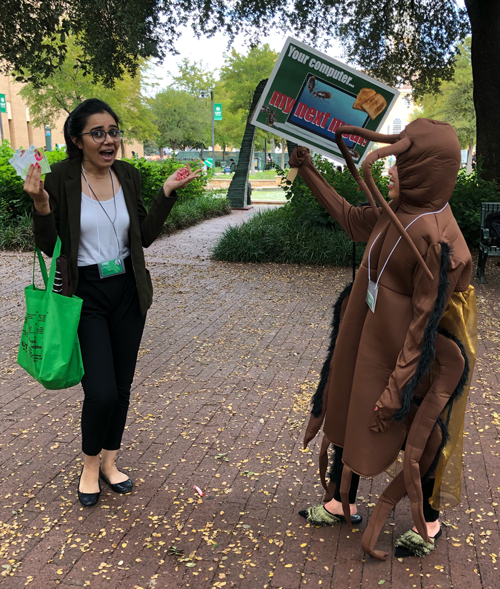 Costumed as a cyber bug, Amisha and Lien visited dining halls, various offices on campus to encourage students and employees to download UNT-provided computer virus protection. "What's bugging your computer?" cards and Smarties® candies have been handed out to help people "remember that smart cyber security is sweet." Contact the UIT Help Desk for help downloading your anti-virus computer protection today! Katrina Flachsbarth, EDUCAUSE Annual Conference, Oct. 31–Nov. 2, Denver, Colo.
Kris Selby, JAMF Nation User Conference, Oct. 23-25, Minneapolis, Minn.
Samuel Wiggins, EDUCAUSE Annual Conference, Oct. 31–Nov. 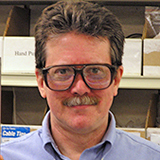 2, Denver, Colo.
Sept. 1: Kris Selby, cross-functional IT manager, Instructional IT Services, from Willis Library. Breakfast with Bob: Jacob Flores, ITUS, was invited this month to have breakfast with Bob Brown, senior vice president, Finance and Administration Division. Irene Frank, Dreamforce 2018, Sept. 25-28, 2018, San Francisco, Calif.
Maureen Saringer, Dreamforce 2018, Sept. 25-28-, 2018, San Francisco, Calif.
Aug. 17: Karen Snyder, senior administrative coordinator, UIT Administrative Services, pauses for quick snapshot of her Hawaiian shirt worn in observance of Hawaiian Day in the Division of Finance and Administration. Breakfast with Bob: DaMiri Young, HPC, was invited this month to have breakfast with Bob Brown, senior vice president, Finance and Administration Division. July 11: Ravi Vadapalli, director, Research IT Services, presented partnership opportunities to Brittany Causey, UNT Development, and information about UNT's new affiliate site of the NSF Cloud and Autonomic Computing Center. DaMiri Young, pictured left, Brittany Causey, Philip Baczewski, Ravi Vadapalli. Yonathan Khoe, MacAdmins Conference at Penn State, July 10-13, State College, Penn. July 5: Raymond Banks accepted a job in the private sector. 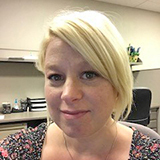 June 22: Clarissa Hutkowski, senior administrative specialist, departed UIT to work in the College of Visual Arts and Design as an academic advisor. 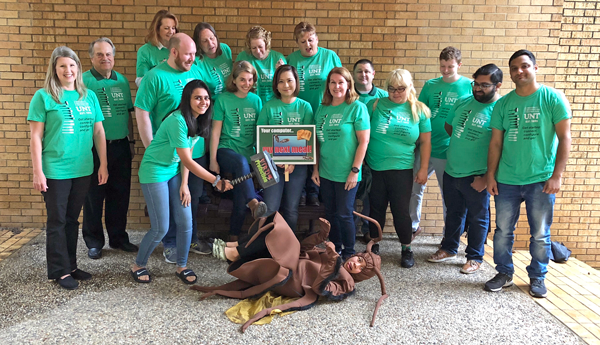 May 23: UIT staff attend annual Finance and Administration Divisionwide Meeting; only the offices of UIT Administrative Services and Exam & Research Data Services closed. March 22: Yonathan Khoe empties his mail tray. 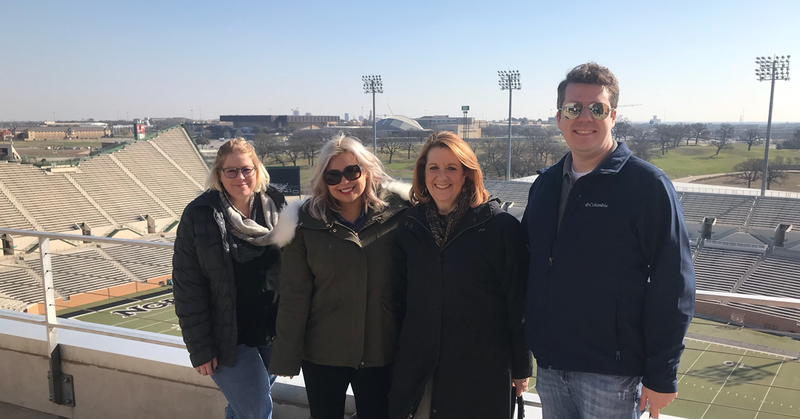 March 14: Catherine Brown, left, Clarissa Hutkowski, Karen Snyder and Jacob Flores attended the Staff Appreciation Tour of Apogee Stadium. Feb. 23: Yonathan Khoe earned the Certified Caspar Administrator certification. Jan. 23-24: Monica Scott-Taliaferro attended the Copywriter's Workshop, National Seminars Training. Jan. 12: The cold snap this month has UIT staff members wearing Mean Green sweatshirts this Friday. 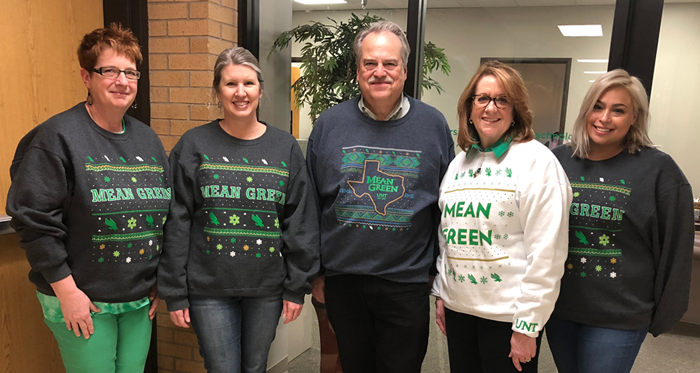 Pictured in sweatshirts from the UNT Office of Orientation and Transfer Programs' sale to benefit the UNT Parents' Association are Elizabeth Hinkle-Turner, left, Mari Jo French, Philip Baczewski, Karen Snyder and Clarissa Hutkowski. 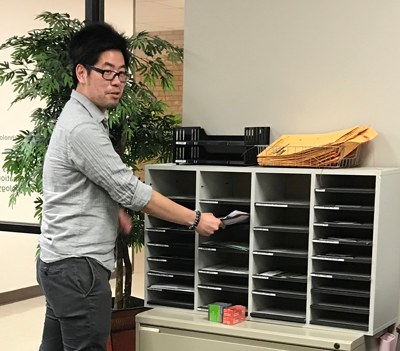 Jan. 10-11: University Information Technology completed a move of its administrative services and other support offices from Sage Hall to the UNT General Academic Building. UIT Adaptive Computing and Learning Lab, UIT Help Desk, and Sage Hall Computer-based Testing Center services have remained on the third floor of Sage Hall. About 12 University IT staff members moved from Sage Hall to the General Academic Building. New office directory. Orientation season kicked off Dec. 8, 2017, for new and transfer students joining UNT this spring. 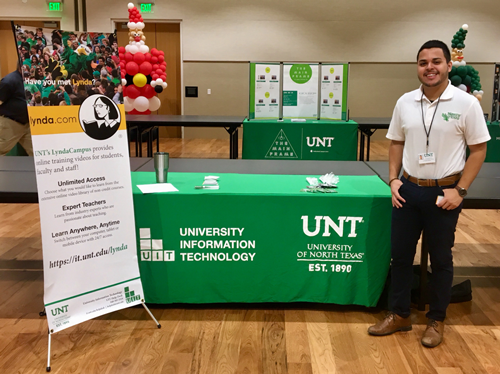 Benjamin Regalado, junior avionics logistics major and new student assistant for UIT marketing and administration, will represent University IT at the upcoming Student Success Sessions for Campus Technology and present the UIT Technology Tour to incoming students. Dec. 1: Raymond Banks earned the Certified Caspar Administrator certification. Banks, Raymond and Yonathan Khoe attended Jamf Nation classes in Dallas, Nov. 27-Dec. 1, 2017. 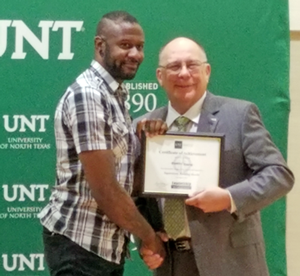 DaMiri Young received a certificate of achievement Nov. 26, 2017, from Bob Brown, vice president, Division of Finance and Administration, for completing the UNT System HR Supervisory Building Blocks course of instruction over the past nine months. 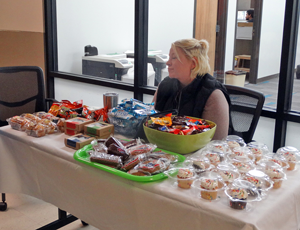 Yuguang Ma, Charles Peterson, SC 17, International Conference for High-Performance Computing, Networking, Storage and Analysis, Nov. 12-17, 2017, Colorado Convention Center, Denver, Colo.
Catherine Brown helped raise money for the State Employee Charitable Campaign at the Oct. 31 UIT Bake Sale. Help Desk, Microcomputer Maintenance Services and the Adaptive Technology and Learning Lab moved to Room 330 in Sage Hall effective Oct. 2. Raymond Banks, Yonathan Khoe, Jamf Nation User Conference, Oct. 24-26, 2017, Minneapolis, Minn. Solar eclipse watchers Clarissa Hutkowski, left, Maureen Saringer, Karen Snyder and Elizabeth Hinkle-Turner take in the sun Aug. 21 at UNT's Rafes Urban Astronomy Center. Yonathan Khoe, IT specialist, Instructional IT Services, attended MacAdmins Conference, July 10-13, The Pennsylvania State University, University Park, Pa.
Katrina Flachsbarth, IT specialist, IT User Services, attended the CompTIA ChannelCon 2017 Conference, July 31-Aug. 2, in Austin, Texas. 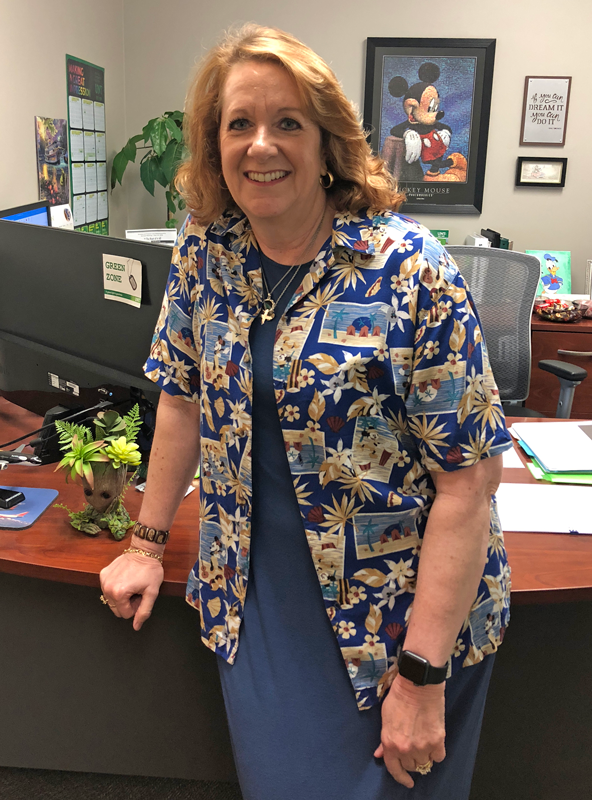 Karen Snyder, administrative coordinator, joins UIT from the UNT Division of Student Affairs succeeding in the position vacated by Mari Jo French. Clarissa Hutkowski moved from Exam and Research Data Services to UIT Administration succeeding in the position left by Robin Melendez-Martin. Robin Melendez-Martin, accepted a new position in UNT Facilities Services as the contract administrator. Robin Melendez-Martin was named HUB Champion by the UNT System Business Service Center. Jennifer Spillman earned the Salesforce® Certified Administrator credential. Carrie Stoeckert, assistant director for planning, budget and communications, transfers to Transportation and Parking Services as the new director for parking services effective April 24, 2017. Philip Baczewski reviewed data on the slides submitted by each department that detailed each unit's 2016 data and accomplishments during the annual get-together. Sharukh Mithani, IT manager, succeeds Deke Isaac as the manager for Microcomputer Maintenance Services with a new title as manager, UIT Support Services, and remains in the same workgroup led by Richard Sanzone, director for IT User Services, Feb. 1, 2017. Katrina Carpenter, IT specialist, also has a new title as assistant manager, UIT Support Services. Feb. 12, 20107: Richard Sanzone, director, IT User Services, UIT, won the Galveston Marathon in the category for males, ages 35-39.